A few steps away from where Overwatch was announced at BlizzCon, 600 PCs sat waiting for attendees to play it. That in and of itself deserves a golf clap. We usually have to endure months of marketing teases before we get our hands on a big game. Blizzard is admirably aggressive about showing off its first built-from-scratch thing in 18 years: I got to play all 12 characters at BlizzCon. The expectations set by Overwatch’s trailer weren’t that far off: this is an FPS built on Blizzard’s unhidden affection for Team Fortress 2. There’s a capture-point mode, and a Payload-style mode actually called Payload. There’s a fast-moving, low-HP pipsqueak who fights at close range. The medic heals with a tether beam. There’s an archer sniper, and a second sniper with a scoped rifle. There’s a class that (as its ultimate ability) deploys a teleporter. There’s a character that builds a sentry turret, then hits it with a wrench to upgrade. It’s easy to hold up these pieces of Overwatch, but in your hands, when all those pieces are in motion, Overwatch doesn’t feel like a TF2 clone. It doesn’t feel like it has Quake in its DNA in the way TF2 does. And where TF2’s nine classes operate as hard counters to one another in a kind of food chain (Pyro hunts Spy who stabs Medic who ubers Heavy or Demo in order to destroy an Engineer’s sentry), Overwatch’s heroes feel a little more like first-person packages of MOBA-like abilities who have looser relationships to one another. There isn’t one character who’s in charge of turrets, for example. Actually, one of the characters is a turret: Bastion transforms into a static gun that can self-heal. He can also toss out a mobile mine a la COD: Black Ops’ RC car bomb. The best expression of Overwatch’s mechanical looseness is the fact that every imaginable kind of character movement is represented: jetpacking, wall-climbing, grappling-hooking, gliding, ability- and equipment-driven teleportation, a superjump, a dashing charge that pins enemies (like L4D2’s Charger). The best term I can pin on it is “mechanical flamboyance.” Overwatch’s diversity is refreshing and fun, but the big question is whether that variety will actually help Overwatch be a great competitive game. The incongruous abilities and characters may simply make it a wild, loose, and playful FPS that happens to have a higher than average skill ceiling. I loved playing as Tracer, for example. She drew on my spontaneity and reflexes in a way that an FPS hasn’t since Tribes: Ascend. Tracer can teleport three successive times. In addition to that, her medium-length cooldown ability rewinds her position, health and ammo to what they were three seconds ago. At one point I phased through a Reinhardt’s front-facing energy shield, appearing behind him to get in a few shots. Then, as he shifted his shield to face me, I rewound time, phasing back through him again to deal even more damage. Tracer’s potential for nimble trickery and harassment is delightfully high. But I have absolutely no clue if this artful dodging gels with a balanced game. The best competitive shooters are usually the most mechanically stripped-down (Quake, CS:GO), but then again, the best competitive MOBAs spread their complexity thick, across a hundred-some characters. 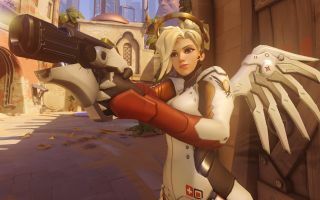 Overwatch is taking a kitchen sink approach to multiplayer FPS, and it’ll be interesting to see how much of its 12 characters and dozens of abilities survive beta testing. At the very least it seems like Overwatch is going to need some sort of character drafting and banning system in high-level competitive play. For now, this is a colorful, creative FPS with a level of polish that we associate with Blizzard games. There are a ton of touches that convey how far along Overwatch seems to be. I liked that Bastion’s basic movement animation, for example, jilted the first-person camera vertically as he walked, a reflection of his robotic movement. I'll need to play it more before I can be sure whether Overwatch has a future as a competitive, skill-driven FPS, but for now Blizzard's twist on TF2 feels both reverential to that source material and original to me. Read Tom's piece for more hard details on Overwatch.